Man and the Biosphere reserves are UNESCO-designated “living laboratories” numbering 621 in 117 countries and are intended to cultivate research, conservation and public understanding of unique ecological sites. In 2002, Mt. Halla, the Yeongcheon and Hyodon-cheon valleys, and the Beomseom, Munseom and Seopseom islets were incorporated into Jeju’s biosphere reserve and there are four other such sites nationwide. MAB designation is dependent on a diverse, mosaic composition of eco-systems. Given this fact and the Korean peninsula’s sloping geology, it is perhaps unsurprising that - in addition to Jeju - three of the four sites lie among the more mixed ecosystems of the lower, wetter, west, rather than the simply high and mountainous east. The program has brought the five sites, and South Korea generally, considerable international attention. Reserve status however, is politically ambiguous: whether it represents true conservation, or merely embellishes “green” cre-dentials, is dependent on national governments as there is merely a review process, rather than binding inter-national law. Despite this note of caution, MAB has arguably raised the profile of threatened ecosystems and encouraged - if not ensured - their preservation. Shinan Dadohae, an archipelago projecting from Korea’s southwest coast, near Mokpo, is one such example. The reserve includes five hundred islets adding up to more than 1,000 k.m. of coastline, and is a resting place for rare migratory birds. Evergreen forests dom-inate the area, competing on a number of the uninhabited islands with Japanese black pine. Traditional industries are also an attraction for tourists. The marine life endemic to the area’s rich tidal flats has long been harvested by local people, usually with their bare hands, a technique uncommon outside of Korea. The reserve is also home to the Tae-pyeong Saltpan, which produces the greatest volume of sun-dried salt in Korea. That said, social transformation has followed rapidly on the heels of economic change and indigenous rituals and beliefs have largely been forgotten. A couple of hours’ drive northeast of Shinan Dadohae lies Gochang County, the entire 672 square kilometers of which was added to the MAB programme in 2013. Another example of the west coast’s diversity, Gochang County has both wetland and upland environments. The location of the reserve, where the warm Kurushio current from the south meets the cold Siberian air mass, means that the area has both northern and southern flora. The Gochang and Buan tidal flats play host to migratory birds: the stork, the Black-faced Spoonbill, Whooper Swan, Saunder’s Gull, Bean Goose, and oystercatchers - worth recounting for their international impor-tance as well as their colorful monikers. They can be seen swarming over the inlets and lagoons, stopping over on their journeys between Japan and China. Running from the westerly point of the Noryeong mountain range and through the urban-rural interior of Gochang County is the Incheon River, bringing a supply of rich nutrients to the coastal region. Gochang County is also home to the largest number of dolmens, with 1,600 of the megalithic tombs being discovered so far. 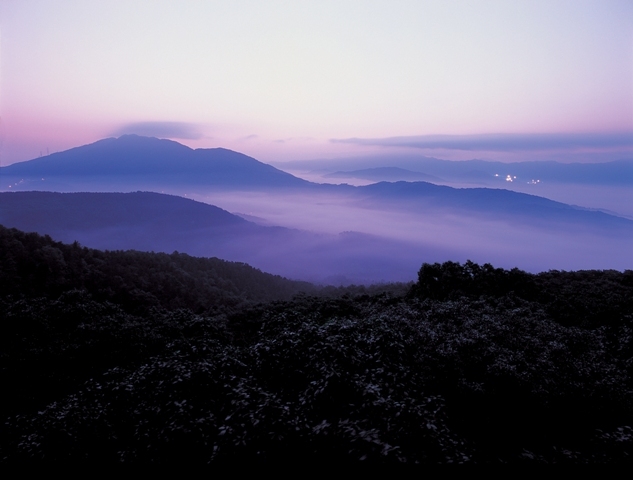 Further north and within striking distance of Seoul is the Gwangneung Forest reserve. Lying in a shallow basin, Gwangneung is South Korea’s best-preserved forest, having been actively managed since it was chosen as King Sejo’s mausoleum forest in 1468. Gwangneung Forest’s 841 plant and 244 vertebrate species have made it the object of international scholarly research. The rare Korean Red-headed Wood-pecker (known locally as the “Keunak”), thought to have the left the area in the ‘90s, was recently rediscovered and there are now 10 mating pairs. Though there remains some limited agriculture, the local economy increasingly consists of meeting the needs of visitors to the area, who come to hike the forest trails and, in winter, ice skate around Sanjong Lake. Korea’s recent drive towards “eco-tourism” has resulted in a rapid suc-cession of designations down the west of the peninsula. However, Korea’s only eastern site is Mt. Sorak, added decades before in 1982. 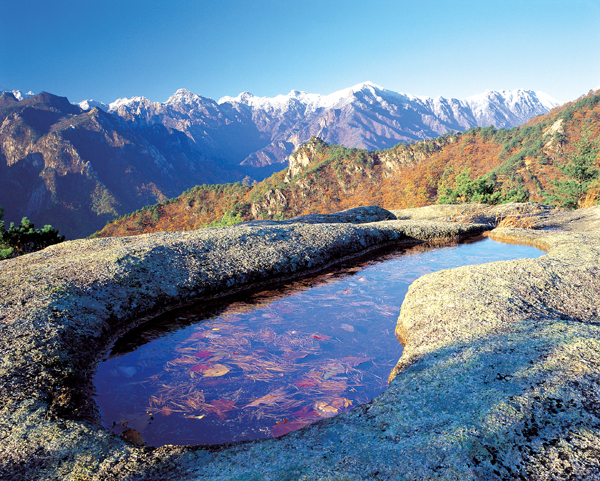 Located in the Taebaek range, the mountainous backbone traversing 1,400 k.m. from north to south, the Seoraksan National Park has an incredibly rocky landscape, with dramatic granite escarp-ments rising out of the pine forests. Visitors can choose to challenge them-selves on one of the many trails or, alternatively, take the cable car to the ancient Gwongeumseong Fortress. 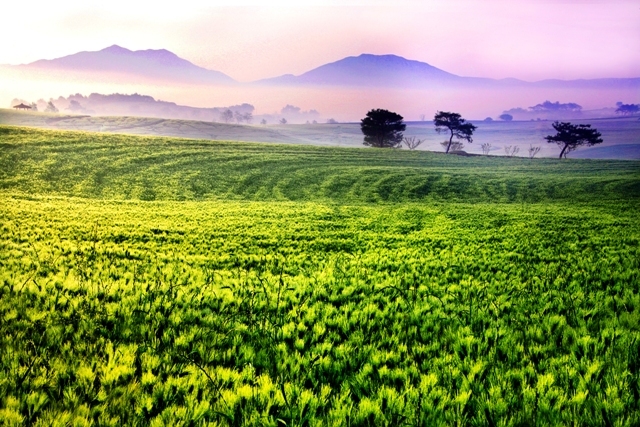 As on Jeju Island, hikers can enjoy stunning vistas, while remaining but a few kilometers from the beach. The heavily protected core area is home to a number of endangered species, including the leopard cat and the Siberian flying squirrel, and, most significantly, the Korean goral. The Taebaek range forms a corridor, allowing the flora of this area to migrate to and from the ecologically diverse DMZ with relative ease.